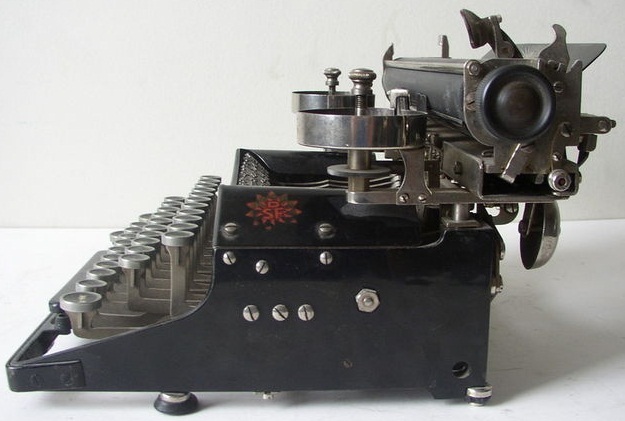 Jakob Heil was a pioneering genius among Austrian-German typewriter design engineers. 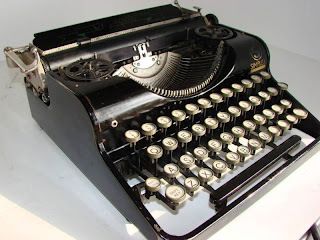 We know of at least three typewriters for which he has been given credit: the Albus (aka Engler), the Diamant and the Perkeo (which emerged from the Albus-Engler). Two of these, the Diamant (above) and the Perkeo, are in my collection, and can be seen together below. The Albus-Engler, a folding portable, was made by Maschinenfabrik Carl Engler GmbH in Vienna and was launched in 1910. The design was quickly taken on and “improved and strengthened” by Clemens Müller GmbH in Dresden, and thus became the Perkeo. It was also sold as the Galliette and the Emka. 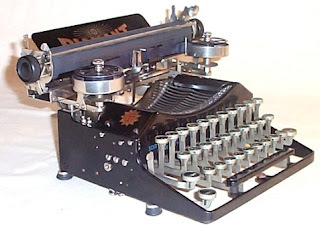 Clemens Müller also made Urania typewriters. Georg Sommeregger asked me later about the serial number. I did locate it, rubbed a thin layer of white-out over it (the only time white-out should be allowed anywhere near a typewriter) and made it out as 66176. 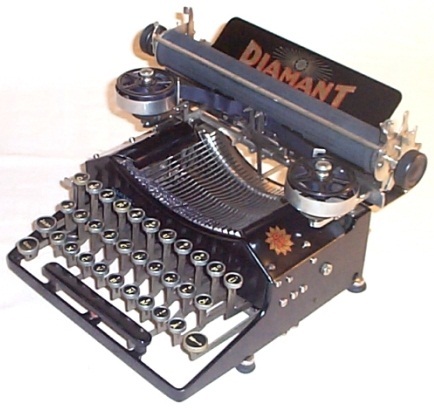 The Diamant was made in Frankfurt by Diamant-Schreibmaschinen Frabik and first appeared in 1919. Production continued until 1926, when the three-bank was succeeded by a four-bank version. 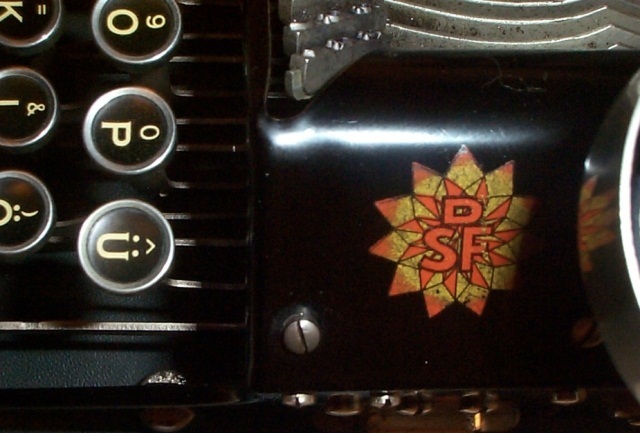 In that time, the Diamant decal moved from the frontspiece (as can be seen on an early example, from the Uwe Breker Collection), where it merely added to a striking resemblance to the folding Corona 3, to the paperplate (where it is on mine). 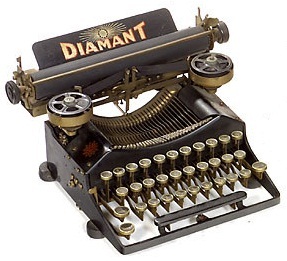 Note too that on my Diamant the letters DIAMANT are embossed around the top of the ribbon spool. The design of the model name decal also changed, on what I am assuming are later models still. My Diamant has the serial number 4838. By way of comparison, the Diamant with the new decal which can seen on Arnold Betzwieser’s website has the serial number 8144. This one does not have the embossed letters on the ribbon spool. 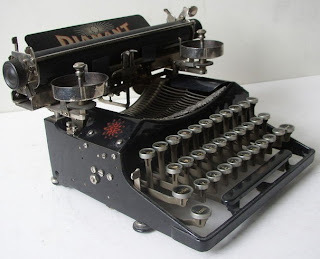 I cannot typecast with my Diamant as yet, because although the mainspring and pullcord are fine, I cannot work out how the pullcord attaches to the right hand side of the carriage. I suspect something may be missing. 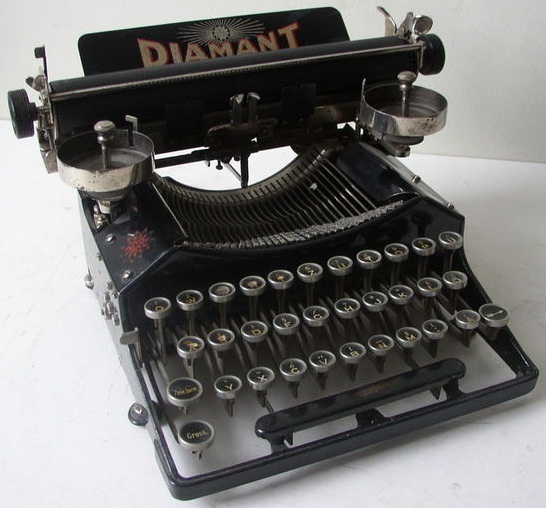 Otherwise, as you can see, the Diamant is in fantastic condition, with not the slightest sign of corrosion anywhere. 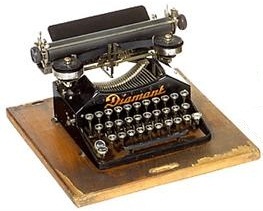 In 1931 Kappel Maschinenfabrik AG of Chemnitz took over the Diamant brand. 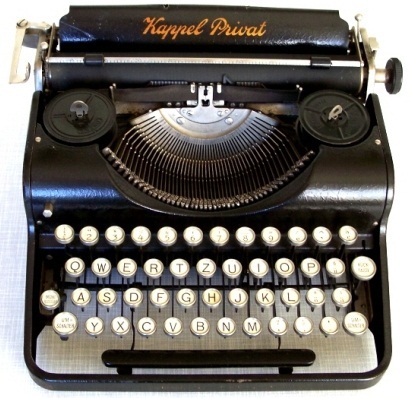 Three years later, Kappel began to market its own portable typewriters. In 1944, Chemnitz was occupied by the Soviet Union and the factory was closed. Kappel portable typewriters belong to the Olympia family and the likeness between this Kappel Privat and one of the earliest Olympia portables, the Simplex, is only too clear to see. 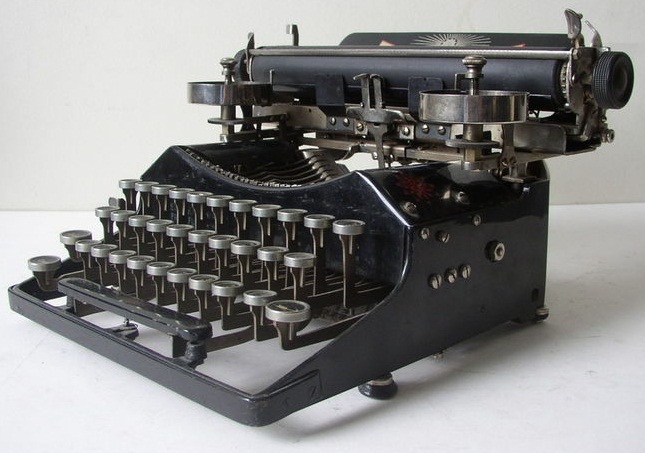 The Olympias were made by Europa Schreibmaschinen AG in Erfurt, part of the AEG Group (of Mignon index typewriter renown). While the Olympia brand was resurrected after World War II in West Germany, it might be possible to draw a line between Kappel and the East German side of Europa, the Optima typewriters made by Robotron in Dresden. Hi Robert, sorry to bring up such an old topic, but I really need to ask. Where did you locate the serial number? Because I found a number on mine, but I don't trust it because it's only two digits long. And I can't be that lucky, right?